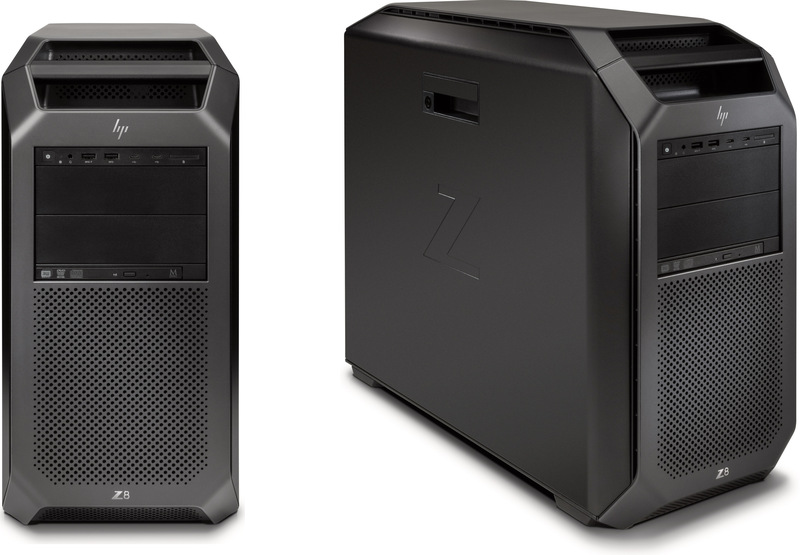 HP has updated its most powerful dual-processor Z8 workstation line with the latest components. The new systems contain up to two Intel Skylake-SP Xeon CPUs with up to 56 cores in total, up to 3 TB of DDR4 RAM, terabytes of storage as well as up to 9 PCIe slots along with optional TB3 and 10 GbE support via add-in cards. 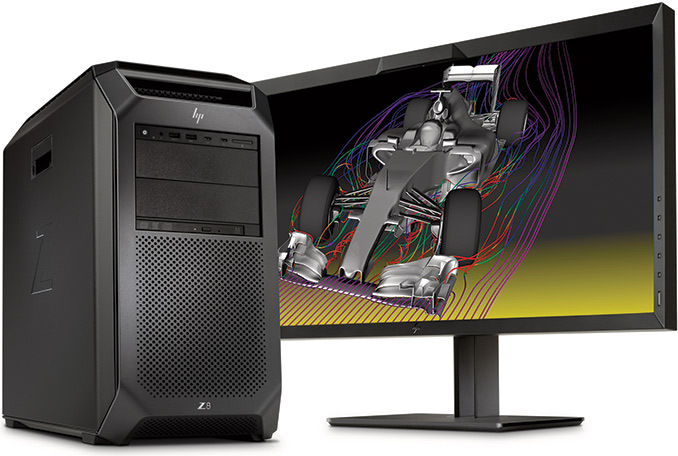 The HP Z8 workstation will be the pinnacle of HP’s computers for personal and professional use and its price in high-end configurations will surpass even the top-of-the-range gaming PCs. Historically, most high-end workstations relied on server platforms to support more than one CPU and thus offer higher performance than any consumer desktop. The emergence of dual-core and then multi-core CPUs a little more a decade ago changed the workstation market quite quickly and significantly. In a world with quad-core CPUs, 4-way workstations did not make a lot of sense for 99% of the users and therefore they quickly became extinct. Moreover, by now, even 2-way workstations became rare. Today, the vast majority of workstations use one multi-core CPU that provides enough compute horsepower for professional workloads, whereas GPU-based accelerators are used for tasks like simulations. Nonetheless, there are still users who need maximum x86 performance and who therefore require 2-way workstations — and the HP Z8 is aimed precisely at such users. While the Intel Xeon Scalable processors with extreme core count were developed primarily with servers in mind, the Z8 is a system that people put on their desks and therefore it has a number of specific requirements regarding noise levels, features, security, compatibility with components and so on. One of the key components of all PCs is its microprocessor. When it comes to the HP Z8, it is based on up to two Intel Xeon Platinum 8180 with 28 cores and 205 W TDP each, which means that the system has to remove 410 W of thermal energy only from CPUs, and this requirement had a significant impact on the design of the whole system. The company did not want to use a liquid cooling system, so it had to design an air cooling solution capable of cooling down two extremely hot CPUs as well as up to 24 DDR4-2666 memory modules. Each processor has its own radiator equipped with a high-pressure air fan (which speed is regulated by BIOS in accordance with system temperature monitored by numerous sensors). 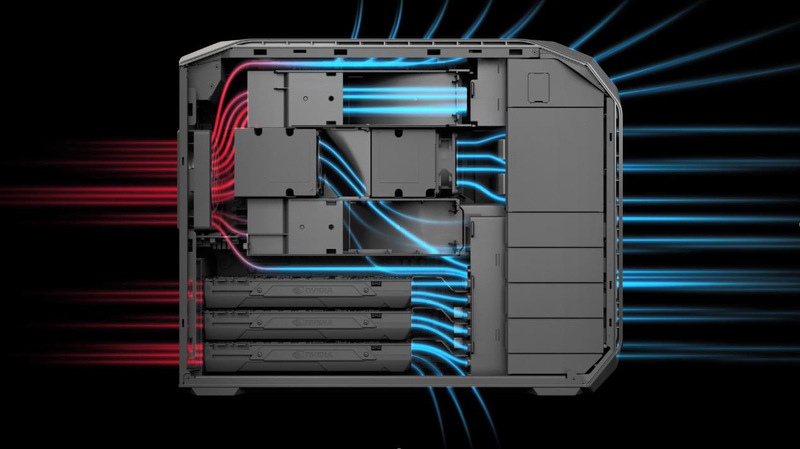 In addition, the system has multiple airflow vents on the front and on the top as well as one fan that exhausts hot air on the back. According to HP, such a chassis architecture ensures that the second CPU does not re-use warm air from the first one, but since they are located in close proximity, one will always affect another with its heat. Finally, the system has additional fans that cool down other components and produce more airflow within the chassis. Speaking of other components, the HP Z8 supports plenty of them — whatever one might want. First off, the system has four PCIe 3.0 x16 slots for graphics cards or SSDs (up to AMD Radeon Pro, NVIDIA Quadro P100 or GP100, up to 4 TB HP Z Turbo Drive Quad Pro, etc.) three PCIe 3.0 x8 (two are non-hot swap) slots for SSDs and two PCIe 3.0 x4 slots. In addition to PCIe-based storage, the Z8 also features four 2.5”/3.5” bays for SATA/SAS SSDs or HDDs as well as two external 5.25” bays that can also accommodate drive form-factor storage devices using appropriate adapters. Those who need it, HP may also install an SD card reader as well as a slim DVD or Blu-ray ODD. When it comes to connectivity, the HP Z8 has all the bases covered. By default, the system supports two GbE connectors (powered by Intel controllers), an 802.11ac Wi-Fi + Bluetooth module (Intel Wireless-AC 8265 controller), two USB 3.1 Type-C ports and two USB 3.1 Type-A ports on the front, four USB 3.1 Type-A ports on the back, multi-channel audio connectors (a Realtek HD ALC221 controller) on the back, a TRRS audio connector on the front and so on. Meanwhile, owners can optionally order to install two 10 GbE controllers, a Thunderbolt 3-supporting add-in-card and a variety of custom components for various industries and workloads (an external audio solution for a 5.25” bay, for example). Since many businesses and enterprises require robust security for all of their machines, the HP takes everything seriously and ships the Z8 with a whole set of security features that it calls HP SureStart. The system features secure authentication, full volume encryption, TPM 2.0, has a Kensington lock and so on. All the CPUs, GPUs, SSDs and other components require a lot of power and HP Z8 has plenty of it. The manufacturer offers 1125 W, 1450 W or 1700 W internal PSUs with up to 90 % efficiency. The PSU is located in a compartment behind the motherboard, so chances are that HP uses proprietary units. Notes 1 PCIe x8 has rear bulkhead access and 2 PCIe x8 are internal access only. Slot 1: Transforms to PCIe x8 when 2nd CPU is installed. Slots 3 and 6: are available only when 2nd processor is installed. Now, time to talk about availability and pricing. HP intends to ship the HP Z8 workstations in October. An entry-level model with one CPU, a basic GPU and storage will cost $2,439. Meanwhile, once the system is equipped with two Xeon Platinum 8180 CPUs, NVIDIA Quadro P100/GP100 graphics, multiple PCIe SSDs, 3 TB of DDR4 memory, several 12 TB HDDs and various advanced I/O capabilities (TB3, 10 GbE, etc. ), its price will easily hit tens of thousands of dollars. It's normally at this point that a vendor such as HP states that the high-end models are likely to be sold under B2B contracts, where per-unit costs are not as severe. One OEM has told us that only 5% of sales of their high-end workstations come through direct sales for onlike pricing. Lack of competition in the high end market led Intel to dramatically increase prices over the last 5 years. Hopefully with the arrival of Epyc that will change. Obviously Intel doesn't sell to Hp Xeons at the prices of official price list. There is a lot of discount for big brands, half the price or a third the of the "official" price is a common thing. The HP Z2 mini G3 took a ridiculous 6 months ago from announcement to actual availability, HP needs to do a much better job with its production and logistics. Hard to estimate prices for this beast, but it looks like the full-up, 3TB RAM configuration would cost about $250,000. The dual Xeon 8180 CPUs are going to cost about $10k each, so that puts a floor on the system cost at around $25k. But most common configs would have 512GB of RAM or less - 256GB is probably more realistic. 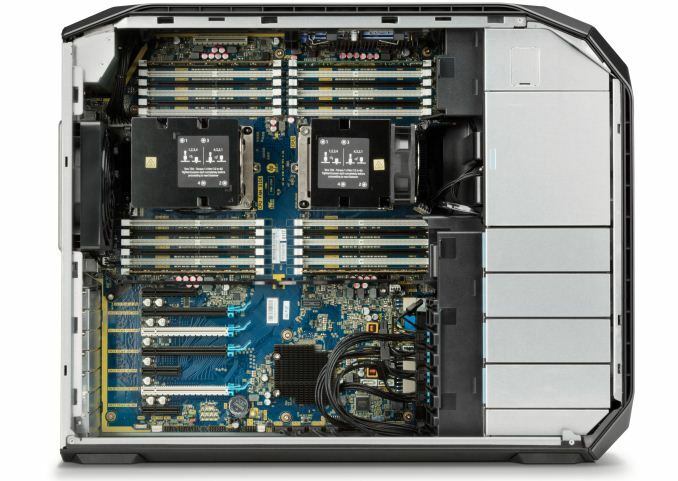 A new top-end HP workstation is always interesting. The specification and features are excellent but, unless I'm missing something, there seems to be an aerodynamic flaw. The diagram of the cool and hot air flow is misleading as the forward CPU does not depict the outflow of hot air from the forward CPU at all. In reality, air would flow directly into the rearward processor. Also, if air were being pushed /drawn from the front into the rearward processor in the highly unlikely two level z-pattern flow shown, there would be a point of turbulence, reducing cooling effiicency. HP might consider an analogous condition: the horsepower limitation of the Harley-Davidson V-twin engine. The rear cylinder is fed heated air from the front cylinder and has a reduced air flow. The consequence is that H-D V-Twins engines have had to run on reduced compression- since WWI. In the previous HP z-series (BMW design), the dual processors were not aligned in this way. It's very orderly looking but it appears that the two processors will be running at quite different temperatures. I find the idea that HP, "did not want to use a liquid cooling system" puzzling and risky in light of the possibility of running up to $20,000+ worth of CPU's (yes, a single Xeon Platinum 8180 28-core costs $10,009) having a heat dissipation of 400W+. Why not liquid cooling? The HP z820 dual Processor and z420-single processor designs both had liquid cooling options. I use a z420 liquid cooler in a z620 that allows an E5-1680 v2 to run at 4.3GHz (140W) on all 8-cores and still idle at 30-33C. Case Styling: in my view, the case styling is a miscalculation given the buyers. It's distracting, mal-proportioned, and tries for clunky-chunky aggressive. Imagine if a Dell Precision T1600 and Fatality Game Boy X-Destroyer Signature Extreme Mid-Tower had a baby. HP might also consider that "Z8" refers to a BMW retro car design of 1999 that tried to evoke a BMW 507- of 1955. Hmmm: Harley Davidson 1913 + 2014 Bad Boy Game Box + BMW 1955 / 1999: not especially evocative of the future. I agree with Ej24's comment regarding the naming of the Xeon Scalable processors. The Silver, Gold, Platinum business is '80's discount store stuff. What is the relevance of the relative value of a metal- not necessarily present in the object? Perhaps it reflects the relative price, but no, that would be too crass. Choosing a processor is an engineering decision, not selecting costume jewelry. The Xeon nomenclature in which no nomenclature or figure represents anything is also perverse obfuscation of the specification. At least one knew an E5-1650 v2 was an LGA2011 single processor second version using up to DDR3-1866 and a "1650" was always a 6-core. But a Xeon Gold can be a 4000, 5000, or 6000 series and we can't assume that means anything in particular: I don't think there can be 4, 5, or 6 CPU configurations. The other new Xeon series, the W-XXXX's is no better and it may be just me, or because everything is "X" and "Z" these days, but "W-XXXX" has a kind of '50's ring to it. The HP Z8 has many positive features capable of the very highest performance, infinitely variable specification, and no doubt will have very good performance and excellent reliability, but unfortunately the Z8 feels to be a rushed and marketing committee driven design.